You know, it's one thing when Mattel updates their own old properties, it's entirely another when they update someone else's. If you've read Rustin's rundowns on the various Imaginext blind-bagged series, then you know they're a collection of unrelated characters. Sometimes there will be two figures that kind of fit a theme together, but that's generally as far as it goes - coincidental alignment of a couple designs. So when a new series comes out, you never know what things Mattel's design team will decide to throw in there. Sometimes it's a snowboarder girl, sometimes it's a werewolf. And sometimes - like this sometime - it's a snake wearing armor. But it's not just a snake wearing armor, it's a specific snake wearing armor. 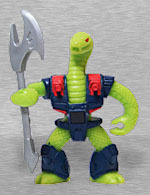 It is, somehow, an update of the old Battle Beasts Triple Threat Snake figure (aka "Snake Bomb" in Japan). 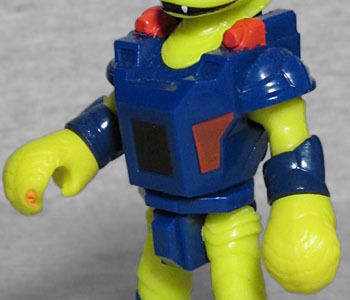 Triple Threat Snake was a green snake wearing blue armor, and this figure is a green snake wearing armor (though the colors are closer to Delta Chameleon). Now, normally that would just be a neat little throwback, but since Battle Beasts was a spinoff of Transformers, it belonged to Hasbro. Not Mattel. They're homaging another company's work! Not even in the way that NECA homages Kenner - at least in that case, it's a question of the rights having gone to a different company. Here, Diamond Select owns the Battle Beasts concept, while Takara Tomy would own the rights to the old designs. Mattel's not in there anywhere. And yet here we are. Surprisingly, this update was made with some existing pieces. The head and hands (which are also snake heads) come from the "Mummies" theme Imaginext has had for a little while now - if you've seen the King Hiss-ish "Mummy Guard," you've seen this before. The old Battle Beast was a plain snake, while this one is a cobra with its hood out, but that's still close enough. The legs, body, and arms are new sculpts, however, so they're free to copy the old figure as closely as Mattel's legal department will allow. We get the two-toed feet beneath shin armor, and the chest armor is very blocky, with straight lines rather than curves. There are red panels by the ribs, and red blasters on the shoulders. There's even a large black square right in the center of the chest, representing the old toy's rubsign - remember, Battle Beasts' gimmick was rock/paper/scissors with elements, so you had to reveal each character's allegience. There's no sticker here, but surely someone sells them, right? The inclusion of wrist armor is new, and seems designed to help hide the wrist joints. 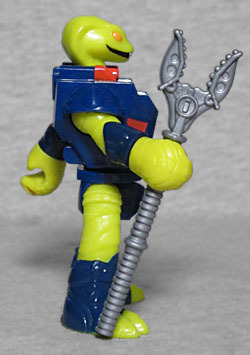 The figure's articulation is a little lower than the average Imaginext offering, because the snake's head does not allow any articulation in the neck. So all we get are swivel/hinge shoulders, swivel wrists, and swivel legs that move as one. Additionally, the shoulder armor sticking out to the sides blocks the arms a little bit, so don't expect your snake to go crazy. The Snake Man includes an accessory, but it's not an homage: Triple Threat Snake carried a silver axe of some sort (called the "Bomb Sabeler" in Japan), while this is... it looks like a clamp. Like some sort of tool designed for handling snakes, not something designed for a snake to handle. It's a neat piece, and has the Imaginext circle-i logo near the top, but if you're already leaning this hard on somebody else's decades-old property, why change this? Why now? I didn't have more than a handful of Battle Beasts as a kid (and my hands were a lot smaller then, too!) 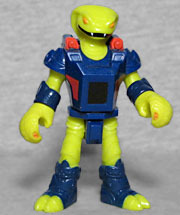 but Triple Threat Snake was one of the ones I did have - I do have - so I was interested in this Imaginext figure as soon as I learned about it. Between this and the MUSCLE figures, Series 11 is pretty nostalgia-heavy!